Villa Olivia is a well furnished, detached villa with a modern interior and a private driveway. 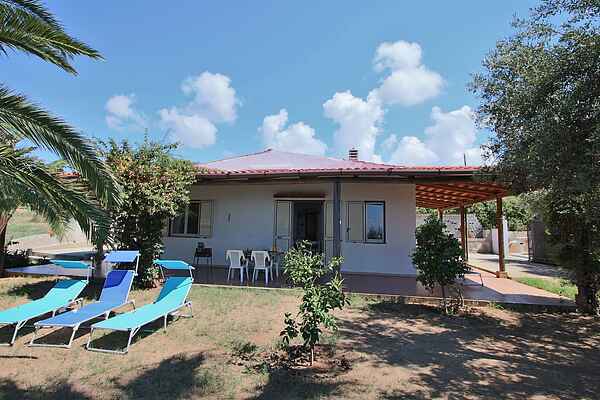 The villa is in a superb seaside location and enjoys a magnificent view of the sea. There is a garden of 1000 m2 and a large terrace with a wonderful, panoramic view. You'll see bougainvillea, roses, ornamental plants, palms and other Mediterranean flora in the garden at the front of the house. The villa is at an elevation of twenty-five metres and is about fifty metres from the sea. Santa Maria Bay with its sandy beaches, pubs and shops is 700 metres away. The surrounding area of Capo Vaticano consists of charming villages in a beautiful, hilly terrain with many narrow roads. You can hire a boat and visit Stromboli, an Aeolian Island which is also a live volcano.